People’s lives were changing at an accelerated pace in the 19th Century. How would new technologies and scientific discoveries mold this brave new world? Authors reflected on this disturbance in the force as they contemplated, invented, and interpreted those changes for their readers. The new, unnamed genre of what came to be known as science fiction stepped in to make sense of or, in some cases, create more perplexity. 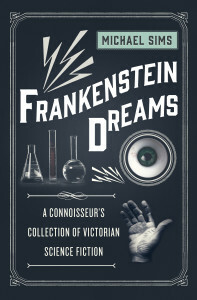 In Frankenstein Dreams, Michael Sims has compiled what he appropriately calls “A Connoisseur’s Collection of Victorian Science Fiction.” A scholarly and sprightly introduction is followed by twenty enthralling stories, each of which is preceded by a prescient introduction that succinctly places that story into appropriate historical and literary context. As expected, classic, well-known writers like Verne, Shelley, and Wells are here; perhaps lesser known (but no less qualified) writers include Mary E. Wilkins Freeman, Thomas Wentworth Higgins, and Alice N. Fuller. The stories are different, but together they make for a compelling read. Mary Shelley’s Frankenstein of 1818 is generally considered the first in a genre that was not named until 1926 in Hugo Gernsback’s Amazing Stories. Frankenstein’s genesis was in 1816, “the Year without a Summer….Wagnerian thunderstorms tormented the heavens,” according to Sims. The eruption of Mount Tambora in Indonesia the previous year continued to create “such dark clouds and low temperatures that winter seemed to linger and take up residence.” Shelley’s intended short story grew into a dark and foreboding novel. The excerpt presented here, “Dreams of Forgotten Alchemists,” reflects that hideous vision rather than the “sunnier” 1831 edition that most of us are more likely to be familiar. Florence McLandburgh (1850-1934) was born in Chillicothe, OH, lived her life in the midwest, and was known for her light verse and serious poetry, some of which was published in the Atlantic Monthly. Two of her quotes are remembered if not her name: “The optimist sees the doughnut / The pessimist sees the hole,” and “Dark as the waiting tomb,” which was published along with Swinburne and Whittier in Frank J. Wildbach’s “dusty old amusement for the terminally bookish,” the 1916 Dictionary of Similes. McLandburgh’s story “The Automaton Ear” was published in Scribner’s Monthly in May 1873. Sims calls it an early “time-viewer” tale — perhaps it is a forerunner of “Dr. Who.” Protagonists of these tales invent technology that enables them to view the past and the future. (Other writers of these kinds of stories include Camille Flammarion and M.R. James.) “The Automaton Ear” turns on the conceit that sounds never die but instead circulate endlessly throughout the cosmos. It is just our inability to her them that caused them to “disappear.” The narrator invents a “time-hearer” after months of feverish and mono-maniacal failure and modifications. Success! “Hark!—The hum of mighty hosts!…I raised my head quickly—it was the song of Miriam after the passage of the Red Sea.” A multitude of voices and music come and go, never to be heard again. With success came a desire to keep it secret from the world. The narrator retreats from society until a “dramatic and heartbreaking” twist ends this brilliant tale. Its language and structure is such that it could have been written yesterday rather than in the 19th Century. Mary E. Wilkins Freeman (1852-1930), who worked for decades as a private secretary to Oliver Wendell Holmes, wrote first for children. She sold her first adult story to Harper’s Bazaar and by the turn of the century was acknowledged as a star writer. Even Mark Twain was a fan, and she won the first William Dean Howell Medal for Distinction in Fiction in 1925. Sims writes, “She wrote about ordinary people living ordinary lives, and the supernatural sneaks up on them through everyday activities.” “The Hall Bedroom” (March 1903, Collier’s magazine) begins in just such a manner. “My name is Mrs. Elizabeth Jennings. I am a highly respectable woman. I may style myself a gentlewoman…I was well brought up….I also married well.” She reports that her husband has died and that her “income was not enough to support me in any kind of comfort, and I saw that I must in some way earn money. Mrs. Jennings, a strong, resourceful woman, is forced to rent rooms to boarders. Rather than tell the story of the mysterious events in the hall bedroom, she chooses to “present the journal of Mr. George H. Wheatcroft” and lets his story unfold in his words. A self-styled loser in all respects, he has the hall bedroom on the third floor, the worst and smallest room in the house. Things happen to him there and, indeed, the supernatural does sneak up on him in the night. He later meets a man who had once stayed in that very same room and relates stories of strange things that happened years ago. 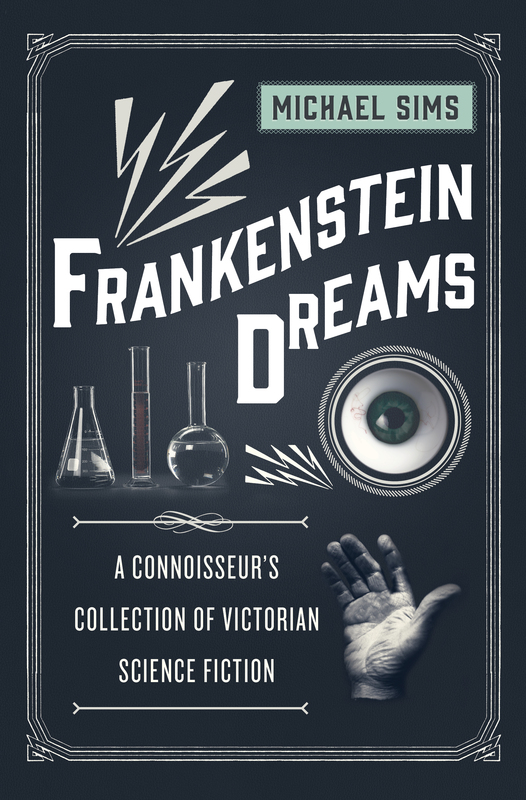 Frankenstein Dreams is a well-curated and inspired collection of tales strange and familiar that illustrates our primal fear of the unknown, dark side of life. Other books by Sims include Arthur and Sherlock, The Adventures of Henry Thoreau, and The Story of Charlotte’s Web. The latter was chosen as a Best Book of the Year by a number of periodicals. His passion for the period is evident as he edits a series of Victorian Anthologies including Dracula’s Ghost.